You may need to add other sorting criteria so that end-users can more conveniently sort search results in the search interface (see Changing How Results Are Sorted). Important: Adding sorting fields has an impact on the index size and performance. It is recommended to select the Sort check box only for fields that you are planning to use to sort by in search interfaces. In the panel on the left, select the field set containing the field for which you want to control the availability to sort by. In the page that appears, locate the field that you want to use to sort by, and then click the corresponding Sort check box. 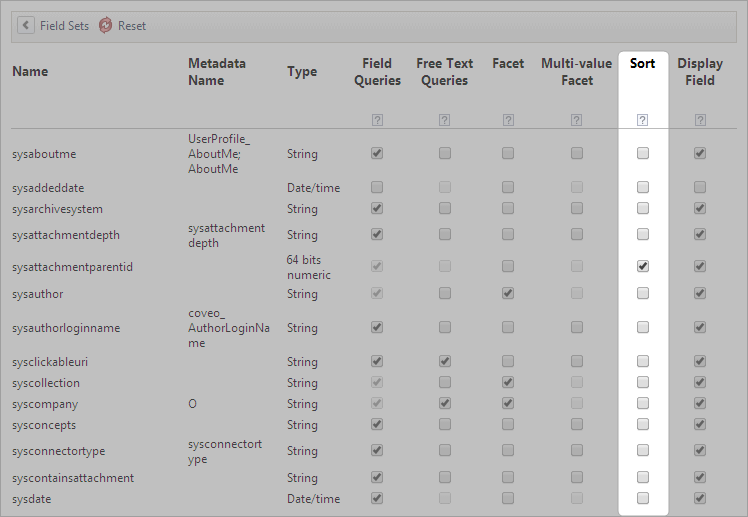 Note: Review the Metadata Name column to identify the original metadata from which the field value is extracted. CES 7.0.6942– (August 2014) When you make an existing field a sort field, you must rebuild sources that are using a field set containing this field. CES 7.0.7022+ (September 2014) The index automatically processes the changes without a rebuild. Using the .NET Interface Editor, customize the search criteria available in the .NET search interface to help end-users sort results more conveniently (see Adding Sort Criteria With the .NET Interface Editor).